Ultimate Customer Satisfaction is our goal at Diablo Motors. We always appreciate your honest feedback, and we are currently working on assembling your reviews from all over the internet and compiling them here for your reading pleasure. Check out what your neighbors had to say, and see what makes Diablo Motors continue to be a cut above the rest, and a welcome departure from the usual car dealer experience! Here are just a few letters from some of our happy customers, and reviews from Yelp, Google, Facebook, Cars.com, CarGurus, DealerRater, and others. We’re adding new testimonials all the time (thanks to you)! At Diablo Motors, we want your car buying or selling experience to be the best you’ve ever had! Please write us a letter or review to tell us about it. If we ever fall short, please let us know right away. Your ultimate satisfaction is our goal! Diablo Motors is a really great dealership! Greg was very honest and upfront about everything; his prices are more than fair, and he made the buying process very painless. I emailed Greg about a listing on Saturday, and came in the next day to check it out. The entire process -- test-drive, trade-in, and purchase -- took about two hours. Diablo Motors has a stellar reputation, and it's easy to see why. I'm very happy to have found this place. I'm not fond of giving accolades to businesses but this is an exception. I've been searching for a replacement car that was totaled and somehow found a super clean BMW 325 convertible on the lot. After a brief conversation with Greg the owner I only needed to convince myself that that was the car I really wanted for the wife. You see I sell high-end plumbing fixtures and I believe in selling honesty and integrity first and foremost. Needless to say Greg has both. I received a commendable customer service even though I was buying the CHEAPEST car on the lot. We have bought 2 cars from Greg and recently I even sent my parents to him when they were in the market for a new car - that's how much I trust him. A few years ago we got a big dog and we were squishing out of our old Honda Pilot. I decided to buy "gently used" because it fit our budget and after looking online, found the make/model of the car we wanted on Diablo Motors' website. I called him up and he explained he wasn't around during the day the next couple days because he was going to be at car auctions, but he could meet me on an evening. My initial reaction was "you gotta be kidding! - how can this guy run a business without being open during the day some days?" I am a stay at home mom and that did not work well with my schedule. However, I had a good feeling after talking with him, so I met him a couple evenings later to look at the car. He impressed me with his non-smarmy, non-pushy approach. That weekend I brought my husband in to look at the car and we bought it. The price was fair. I did not feel like I was getting a screaming deal BUT he gave us a trade in of $9000 for our old Pilot which no one in their right mind should have done- it was such a disaster! A couple years later, Greg found my husband a 2 year old Audi at Auction and saved my husband $15k over buying it new from the dealership. We are very happy with our experience at Diablo Motors. Greg is a genuine, honest businessman who runs a good business and cares about his customers. I recommend him without reservation. We have bought 2 cars from Greg and recently I even sent my parents to him when they were in the market for a new car - that's how much I trust him. A few years ago we got a big dog and we were squishing out of our old Honda Pilot. I decided to buy "gently used" because it fit our budget and after looking online, found the make/model of the car we wanted on Diablo Motors' website. I called him up and he explained he wasn't around during the day the next couple days because he was going to be at car auctions, but he could meet me on an evening. My initial reaction was "you gotta be kidding! - how can this guy run a business without being open during the day some days?" I am a stay at home mom and that did not work well with my schedule. However, I had a good feeling after talking with him, so I met him a couple evenings later to look at the car. He impressed me with his non-smarmy, non-pushy approach. That weekend I brought my husband in to look at the car and we bought it. The price was fair. I did not feel like I was getting a screaming deal BUT he gave us a trade in of $9000 bucks for our old Pilot which no one in their right mind should have done- it was such a disaster! A couple years later, Greg found my husband a 2 year old Audi at Auction and saved my husband $15k over buying it new from the dealership. We are very happy with our experience at Diablo Motors. Greg is a genuine, honest businessman who runs a good business and cares about his customers. I recommend him without reservation. Greg and his team made the the process of finding a great quality car at a good price easy. I really appreciated the no pressure sale. They were very helpful and informative during the process of finding a car for my daughter that was safe, reliable, and affordable. I highly recommend Diablo Motors to anyone looking for their next car. My girlfriend and I recently bought a car from Greg. He is very professional, and understanding of his customers budgets. All the cars he sells are fine cars, with his in-house mechanic doing the 200 inspection before the car is rolled onto the lot. The professionalism, the experience, and the ease of buying a car all make this place one of the best places to buy a car. If you're looking for good quality used vehicles that you can just drive off with, get registered on the spot, and don't have to worry about issues, I'd go here. We will again. If you're reading this review, be sure to use your check-in; there's a little surprise in there for you ;-). Greg thanks for making my girlfriend and I feel so great about buying a new vehicle! What an excellent experience! We were given an extremely fair trade-in value on our Mini Cooper convertible and drove home in a gorgeous BMW 335i convertible. Greg was extremely fair in his dealings with us and very professional. We will definitely go back if we want another vehicle, and will be referring friends. Diablo Motors is just what the doctor ordered. There is a myriad of auto dealerships, as many of you know, but rarely does shopping for a vehicle result in satisfaction. These days, compared to the seventies, consumer information is readily available, via the Internet. So, after obtaining financing, which took all of 5 seconds, I went shopping for a car, for my wife---online. My shopping covered distances throughout the lower 48 contiguous states, but preferably closer to home, California. I served in the US Air Force for 22 years and I am now a US Civil Servant for the past 18 years. I mention these careers to show evidence of my customer service experiences, throughout the world, e.g. South Korea, Japan, Thailand, Philippines, and 16 of the 50 countries in Europe. My family and I also had customer service experiences, here, in the states, as well. Diablo Motors, which is located at 2067 San Ramon Valley Blvd, San Ramon, CA 94583, jumped off my short list of dealerships because somebody spent some time and money on Diablo Motor's website. Specifically, Mr. Greg Meier, nice guy, greeted me with a smile and a firm handshake, after he returned from a test drive from an earlier customer. I manage contracts, and my biggest challenge is resolving customers' wants and needs and 99% of the time customers have no idea what they truly need or want...this takes up a lot of valuable time...of which I have very little. Greg processed the required paperwork in less than 10 minutes and I was out the door on my way home to deliver an immaculate, low mileage, white 2017 BMW X3. According to my financier, the sticker price was below blue book and according to them was a good price offer. It would have been great if Greg would have given me a $1000 discount so that I could buy lunch in California---smile! Very important. One of the most distinguishing parts of a transaction is the support that you may or may not receive after a purchase. I had some questions for Mr. Meier, nothing show-stopping or earth-shattering, to complete my transaction, and his responses, via email, were priceless. He responded, so quickly, that had not completed the next email, addressed to him, where he not only answered my concerns but offered his assistance...rare! I will keep all of you readers abreast of Mr. Meier's support because it's not over until...well you know! My initial intent was to rate this auto dealer as a 4.5-stars until I received his support after purchase, then I decided after his support to rate his service as an earned 5-stars. Excellent service. Diablo Motors is definitely an MVD--Most Valuable Dealership!!! Thanks Greg! I'd been in the market and searching for a car for a few months. Fortuitously I found a well priced 2015 VW Tiguan, newer than the other cars I'd been comparing and with more features. I saw the ad on THU evening, and Greg replied within the hour. FRI morning we had a brief chat when I learned that Greg had a rigid time constraint for the car I had interest in. My cousin and I went to Diablo Motors from Menlo Park, then Berkeley. Point is, this was geographically undesirable especially considering FRI traffic. Arriving to the Diablo, Greg was with a customer and Rahmin gave me the keys to test drive the VW. We came back, said we'd go to In-n-Out burger to think about it. Upon returning I wanted to trade in my BMW and Greg was amenable. This is a trustworthy and honest used car place. Over the past few months, I've seen the gamut of used car salesmen and Greg is the only one I would deal with again and send people to. Going forward, however inconvenient it may be for me to get from SF, I plan on buying future vehicles from Greg. I am so pleased with my purchase and how quickly and flexible he was. This letter comes as a reaffirmation of our faith and trust in your services, as evidenced by the fact that we have now purchased four vehicles from you in as many years. Because of your affable and dependable nature, we have relied on your expertise and your ability to search for and find the perfect vehicle, according to our expectations. You have yet to disappoint us in this endeavor, and we are very appreciative of this. Buying a car is at best taxing and time-consuming: therefore, having a knowledgeable and honest broker is indeed rare. Having the extra bonus of feeling a personal bond with this individual is even more unique. We do not hesitate to tout your praises whenever anyone mentions the ordeal of purchasing a vehicle. We proudly display ours as evidence of our satisfaction. Once again, thank you for your splendid customer service skills, Greg. We are so very grateful that the “Diablo Dealer” introduced us to Diablo Motors. - Bill and Nike K.
I want to express my thanks to you and your staff for the courteous and professional manner extended to me during my recent purchase of a 2003 BMW 530i from your dealership. Prior to the purchase, I used your dealership to maintain my 1999 BMW 528i for the past three years. I always appreciated the prompt, professional service I continuously received. This service convinced me to make my recent purchase. I would highly recommend your dealership to any person seeking either service on their current vehicle or purchasing another. Thanks again. I wanted to write a note regarding my experience of purchasing my 2009 Yukon from you. I searched the internet for the best deal which had the options I wanted. When I found the vehicle, I came in to look at it and your employees showed me the vehicle and answered any questions I had. I felt very comfortable and completely relaxed. When I test drove the car with you, it was effortless and hassle free. You made the entire experience of purchasing my Yukon, along with trading in my car, effortless. I felt no car sales pressure which I completely despise. Being a salesperson for 30+ years, it gives salespeople a bad reputation. Thanks again for your efforts and the great vehicle. I just wanted to thank you for the refreshing buying experience at Diablo Motors on my recent Porsche purchase. As I told you during the transaction, I was impressed with your honesty, integrity, and straightforward approach to selling a car. As you remember, I almost bought the car once before, changing my mind and doing some more “looking”. As I looked around, I found that many of the sellers just didn’t meet my personal standard of integrity, not to mention the cars, although advertised as “spotless”, were far from it. All the while I kept thinking about the car you were selling and the sense of trust I had from talking with you. I came back to look at the car one more time and we made the deal. I’ve put several hundred miles on the car and it is everything I hoped and more. This is my third Porsche and I intend to keep it for a long time! I would definitely recommend your business to others and will check your inventory if I am in the market for another vehicle. Thanks again! I wanted to write and tell you how much I enjoyed the buying experience with Diablo Motors. After leaving your lot to continue looking at the cars on my list, I distinctly remember feeling quite different than I normally do after car shopping. I felt good. I felt like I was dealing with a sales team that knew their products inside and out, and was backed by a service organization I could trust. It took me about a week to find and drive the nine cars on my list, all basically identical in terms of miles, features, year, etc. In the end I chose the car at Diablo Motors for the simple reason that I felt the best when I was there, in an atmosphere of comfort, care, and honesty. Well done. I’ve bought quite a few cars in the 40+ years I’ve been a licensed driver. I can’t think of an easier or more pleasant experience than the one my wife and I had with you last month. That’s because there hasn’t been one! You surpassed expectations – delivering a car that was more and better than what we asked you to find for us! You stayed within our price range too! (That dosen’t leave much room for dissatisfaction.) We are now committed future buyers of the kind of cars you keep in stock: lightly-used, well-cared-for, pre-owned premium vehicles. We’ll eagerly anticipate returning in the years to come. Thanks again! Many thanks to you and your wonderful crew for the kind, courteous, efficient and friendly treatment I received when purchasing my automobile. When you are a woman with little knowledge of the mechanics of a car, it is comforting to know you are dealing with trustworthy people. Thanks again. This letter is long overdue and I wanted to personally thank you for the 2002 BMW 540i which I am thoroughly enjoying. Your expertise and commitment to providing top notch quality vehicles gave me great comfort in purchasing the BMW from you. Throughout the sales process you were very patient. You addressed all questions and concerns in a professional, knowledgeable and non-carsalesman fashion…I appreciate that! Additionally, the 90 day bumper to bumper warranty was an added bonus in deciding to purchase the vehicle from Diablo Motors. The very minor items which came up after driving away were handled by Brad and Fritz with absolutely no hassle. I appreciated their commitment to providing high quality customer service! You have taught your staff well! Not only can I count on you for car purchases but I have already had my first oil change with Diablo Motors. Once again, complete professionalism was exemplified by your staff who were a pleasure to work with! Keep up the good work. I finally kicked my kids off the computer so I could have a chance to let you know how much I’m loving my new RAV 4. It’s a great car and I’m so glad I drove out to Diablo Motors to buy it. You made it a great car buying experience – no pressure at all. I really appreciated how low-key you were. I think my kids put more pressure on me than you did! I’ve been telling everyone I know to go see you when they need another car. The price was right, and I couldn’t be happier! Thanks again. I am writing to thank you for the excellent treatment we received from Diablo Motors. Over two months before our actual purchase, I walked in to your facility and you took time to carefully explain your way of doing business even if I wasn’t ready to buy a car. No sales pressure at all. Same with the couple more times that I stopped by to casually browse your cars. When we test drove the Mercedes S430 with my wife, we felt confident that we were talking with a businessman who treated us like fellow professionals—with respect. My wife and I were confident enough to decide to purchase 2 cars at the same time. Even more impressive was Greg’s integrity when he honored the low price quoted on the website that was put on erroneously. He could have easily said, “Sorry that was a mistake, here is the real price”. It was the first time that I could say I enjoyed the car buying experience. Last week I bought a spare key at the local BMW dealership and approached a couple who were browsing used cars. I actually told them to leave and go to Diablo Motors and get the best deals on quality cars! We just bought another car from Diablo Motors. Actually, we found what we thought was a good deal from another dealer on a 2005 Corolla for our daughter who attends UCSB. We called Greg and he asked us to give him a day to beat the offer. True to his word, he went to the Toyota auction and found us a 2007 Corolla with the exact features we wanted with half the miles (15000) at the same price. He had it ready by the next day for our daughter to drive down to UCSB. Thanks again Greg. - Bill and Elizabeth L.
I just wanted to drop you a quick note to let you know how pleased I am with the BMW I purchased from Diablo Motors last May. In my younger days, I purchased a brand new 1974 BMW 2002; it was a great car that I drove for 7 years, loving everything about it, until my job sent me overseas and I had to depart with it (my brother still has this car!). 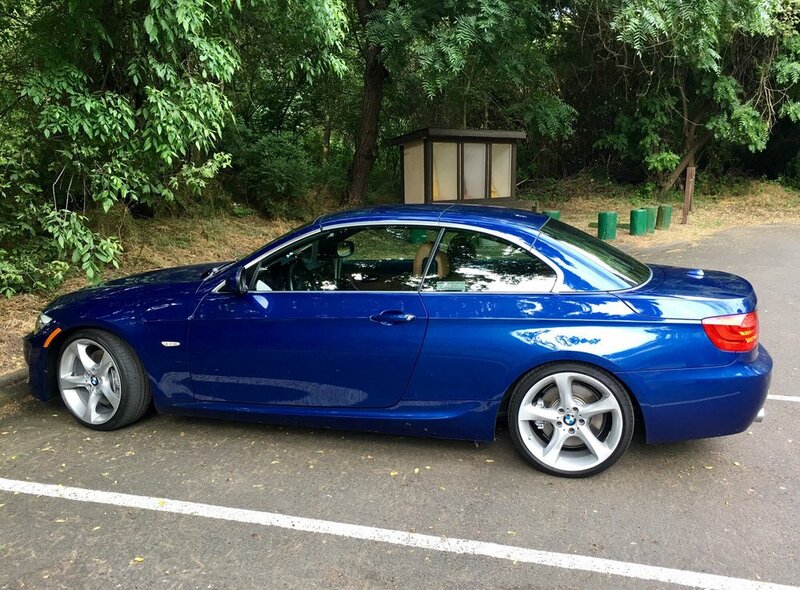 Subsequently, although I have always wanted another, I had never found it economically feasible to buy another BMW as, with my commute, I put 25K miles a year on a car and the cost of a new BMW did not make sense. With our younger daughter turning 16 last year, we decided we needed another car in the family. Our initial plan was to purchase the new “cheap” car until I got a wild hair and decided to surf the web in search of a used BMW. I have always been leery of buying used cars and not knowing if you are getting someone else’s problems. Fortunately, I found Diablo Motors during my surfing and the rest is history. I could not be more pleased with the choice I made to buy the 2002 BMW 530is from you rather than purchasing a brand new “cheap” car. I love this car, there is nothing like “driving a beemer”. The warranty you offered on a 5 year old BMW is superb and shows that you really do stand behind the cars you sell. I believe your warranty is better than any you would get at a BMW dealer. It is always a pleasure to come by your shop, drool over you current inventory, and talk cars with you and Brad. The customer service you provide is excellent; I will definitely be buying my next BMW from you and will not hesitate to recommend you to my friends or anyone else looking to buy a used car and feel comfortable in that decision. Thanks again! Addicted to Diablo Motors!….Hello new customers. My name is Steve N. I live in Walnut Creek. Over the past 8 years, I have purchased 4 perfect Jeeps from Greg. Fantastic guy. His unique style has captured my future dedication as a customer. Fair prices, excellent selection, reliable vehicles displayed. The showroom has many vehicles to choose from. My price ranges displayed up to date neatly, as you enter this clean organized indoor facility. I have seen many dealerships around. This company offers so much for so little. For sure it is the right choice for me. Now you make your purchase. Good luck and be a proud owner just like me. I recently purchased a pre-owned Audi A4 convertible from Diablo Motors through their owner, Mr. Greg Meier. This purchase was made after scanning the local market and the internet via a number of Vehicle Sales websites e.g. Edmunds.com, to assess what options were available to me. After identifying a number of opportunities, I visited quite a few dealers with the hope of finding the vehicle that met my needs. My experience in dealing with Mr Meier was an important factor in making a decision to purchase through Diablo Motors. I was very impressed by the professional manner in which he conducted business. He was very accommodating, allowing me to view, and more importantly test drive the vehicle more than once. He was very willing to share his knowledge of the car’s potential, and l always felt that he was playing open cards. He was not very pushy or overly aggressive (as I found with some dealers) and as a result I felt very comfortable engaging with him on a possible sale at the time. He was willing to listen to my concerns, and addressed them with the patience one seldom sees these days. Although not linked directly to sale, I was most impressed by the condition and state of his workshop – this is an indication to me that the car had been properly prepared and gave me every confidence that the after sales service would be of the highest quality. The unique 90 day bumper to bumper warranty was another plus. In concluding the purchase, Mr Meier and staff managed the administration flawlessly, prepared the vehicle and follow up commitments were met. All in all, this was a very positive buying experience for me. I would definitely recommend Diablo Motors to my colleagues and friends. Greg of Diablo Motors was highly recommended by a friend as honest, fair and a good judge of cars. I was not disappointed. Greg’s low-sell/no-sell approach took the “huckster” factor out of buying a car and his friendly, pleasant manner made my shopping experience enjoyable. Greg listened well, answered questions I forgot or didn’t think to ask, and didn’t try to sell me a car I didn’t want (Jeeps and Beemers, his specialty, were not on my list). When I walked away to think overnight about a Corolla that did catch my interest, he didn’t follow up with high-pressure, irritating phone calls. End result: I drove away with a car that was much nicer than I expected to buy. Now, if I want to keep the interior looking good, I won’t be able to eat chocolate while driving, but that’s a small price to pay. Diablo Motors competes with the big dealers by offering better prices along with a thorough vehicle inspection, warranty, and license/registration service (the sticker and registration arrived super fast). Greg’s personal touch, available only from a small business, humanizes the act of buying a car. The presence of his dog during the purchase transaction was an added plus for me. Do yourself a favor and buy your next car from Greg at Diablo Motors. I know I will be a repeat customer. Thank you for your superior service, for your good taste in cars, and for completely changing my mind about car salesmen! You guys are AWESOME and I couldn’t be happier with my new Audi A4 Cabriolet…in red of all colors! Wow! Thank you for all of your help, for the great service, and for being so nice! I think all car salesmen could use a lesson or two from you guys! Keep up the good work! Thanks again. - Cheryl and Jeff N.
I just wanted to take a moment to let you know how pleased I am with the 2003 Nissan Murano you found for me. I’ve driven the car for a month and I swear it seems brand new – I haven’t found anything to suggest it isn’t new and it’s four years old! You really outdid yourself this time. I also want to thank you for the way you conducted yourself through the whole broker and sale process. While I’ve come to expect great service from you, I feel I should acknowledge it, nevertheless. As always, you kept me informed of upcoming auctions you’d attend on my behalf and you honestly communicated how potential purchases met (and in some cases, didn’t meet) my list of customer requirements. Your information and advice has always led to great results. To put a cap on things, I value how you thoroughly check out the car, to ensure that it meets your high quality standards, before you turn it over to me. This is especially important since I’ve bought cars for my daughters through you and could rest assured, knowing that they were driving cars that were safe and dependable. I trust you in this process completely – I guess that’s why I’ve turned to you, again and again, to purchase our cars. Words cannot express how happy Tyson and I are with our new car! I’d like to thank you for your fantastic customer service, your honesty and your generosity with giving us such a fantastic deal on such a fine automobile. Your knowledge and wisdom about BMW’s made our decision to buy the 530is so easy! I never thought a car could make me feel this good, I truly feel like a different person! I am so happy that I didn’t wait to buy, like you say on your web-site, “life is too short to drive a crummy car!” I actually had trouble sleeping last night; I had a strong desire to run outside to make sure “Fierce” (yes, I’ve named my car) was okay! We’ll be back in July when Tyson is ready to buy his BMW. We will both refer you to anyone who is looking for a like-new, pre-owned vehicle that doesn’t want to deal with the pushy salesmen at dealerships. Thanks again for everything! Four thousand miles ago, I took delivery of Nero, my “new” 2002 530is. As I come up on my first oil change, I’m delighted to report that, um, I’m delighted! I’d also like you to know how much I appreciated dealing with you. First, your sales style is a refreshing break from the typical high-pressure used-car salesman stereotype. And I was struck that you were willing to bid at auctions on my behalf with nothing more than my word that I would pay you for a car. Secondly, knowing that you personally service BMW’s in addition to selling them gave me confidence that you would be able to identify and avoid cars with hidden problems. At the end of our first meeting, I asked you to “find me a good one”, and I felt confident then that you would be able to do so. So thank you, and I’ll look forward to working with you again. We purchased two Jeeps from Greg and have been very satisfied with our experiences with him. We first bought a 1995 Grand Cherokee Limited in 1997, and in June 2004, traded it in for a 2000 Laredo. In both transactions dealing with Greg has been extremely easy and unlike the typical car buying ordeal we were used to. The recent experience was especially satisfying. We went to Diablo Motors to have the air conditioning fixed on our Grand Cherokee (which had 130,000 miles on it). Greg checked the blue book and gave me a fair price on the old Jeep and even let me drive the Laredo home, trusting me to bring him a check the next day. We do not like dealing with slick, high pressure salespeople with their shiny shoes and false sincerity. Nor do we like the negotiating games they play with their sales managers. If you like this kind of experience, then Greg is definitely not for you. But if you like dealing with an honest, fair, hard working, low keyed, informal, knowledgeable and local small businessperson who hopes and plans on being around for years to come, we highly recommend Greg Meier. I just wanted to drop you a note to let you know how happy Mary and I have been doing business with Diablo Motors. I can honestly say that we have never written a letter of thanks to any other car dealer in the past. But we felt that after purchasing FIVE cars from you, that you had certainly earned our thanks. It is not very often in this day and age that a car dealer goes out of their way to help the customer in the way that you continue to do. Your honesty and flexibility during the sales process and your continued personal service following the sale, will keep us coming back to Diablo Motors. We will also continue to recommend your company to all our friends and business associates. Thanks again for making the purchase of our cars a pleasurable experience. At the time we began searching for our car, my husband and I were going through other stresses in life and really wanted to just find a good, safe, reliable and affordable car quickly. Well, when we heard about you through a mutual acquaintance, we immediately trusted that person and went to see you. You narrowed it down to the perfect car our family needed and could afford in just 30 minutes. You made the paperwork very easy and we are so pleased with our new 2002 Toyota Corolla that our next car purchase will definitely come from you. Thank you for extending your time to us and giving us such a fine deal. We have purchased four cars from Greg Meier at Diablo Motors and could not be more pleased with the total experience. In every case, two Jeeps off the showroom floor and two VW’s via auction purchases, Greg has met or exceeded our expectations on price, quality, and schedule. He is an excellent communicator throughout the buying process, pointing out the choices and options available, yet never is pushy or intrusive. He listens well and is sincerely interested in his customers satisfaction, not just his own profits. When we pick up the cars, they have been thoroughly checked out and are road ready without hassle…We have found dealing with Greg to be a breath of fresh air of honesty and integrity in the notoriously shady world of used car sales. He makes the car buying experience easy, and we will continue to call on his services in the future. I just want to say how much I enjoyed not only a wonderful car in my M5, but an overall great experience at Diablo Motors. You handled the paperwork easily within an hour, which meant a lot to me since I’m a very busy person. The car was prepped perfectly, it looked brand new, and everything was in order. I had several follow-up questions over the phone, which you answered promptly. I also appreciated being able to always get through to you on the phone; a definite plus. Bottom line: the price was right, the service was great, the whole deal was great. Make sure you have a 2005 M5 in stock in a couple years so I can stay up to date. As you know, my wife and I have purchased three vehicles from you in the past couple of years. The first car was the 740iL BMW which we bought in September of 2003, and since that time we have acquired a 323i and recently a 528i. We have been most pleased with those purchases, and would like to express our thanks for the professional way you approached each sale. The follow-through has been great, and when there was a need to review something with the vehicle, you were quick to attend to it. If we choose to be involved with more cars in the future, we will look to Diablo Motors first. Again we want to express our appreciation for your efforts and look forward to a continued good relationship in the future. What can I say…Your personal service has earned my business for two Range Rover purchases and the sale of our Volvo. The cars have been in supreme condition, and I respect the fact that you are honest and willing to go the extra mile for customer satisfaction. I’m looking forward to my third purchase. Linda and I wanted to take this opportunity to thank you for our purchase experience with your company. We are pleased to note that your professionalism and the quality of the BMW we purchased from you exceeded our previous experience with dealerships, and we will not hesitate to highly recommend you to our friends. You are a pleasure to work with, and importantly, the car you sold us is exceptional; better than any comparable make and model available anywhere else, and Linda extensively researched the internet inventory including for sale by owners, dealerships, and independent car dealerships. To top it off, the price for the car was better than was available anywhere else. Thanks again for your professionalism, excellent inventory, and great pricing. - Greg and Linda D.
Jeanie and I can’t express how pleased we are with our Audi A4 Convertible. You know I’ve been trying to purchase a top notch vehicle for some time and you really made it simple. When my co-worker saw Diablo Motors on the license plate, he told me the next day… “so you saw Greg… I’ve bought my last three cars from him and will never go anywhere else”. Your reputation as a straight shooter is well known and we’d just like to reiterate the depth of your professionalism and kindness as well. Also, showing up at 9:00pm to meet the two of us is reflective of your commitment to customer satisfaction. Both Jeanie and I look forward to doing business with you and your crew at Diablo Motors for years to come. Thanks again! - Paul and Jean Marie F.
I recently purchased a truck from Diablo Motors and I just wanted to say how satisfied I was with the entire process. I am only 21 years old so it was my first time buying from a dealership, having previously bought privately. I went to a few other big dealerships and they did the whole run-around with me and I could just tell immediately that they were stereotypical salesman. When I called Diablo Motors it was on an odd day and at an odd time, but you guys still found a way to accommodate me. As soon as I went out there I was impressed with the quality of the truck I was looking at. I found it very nice that there was no run-around and it was just a straight up kind of place. It didn’t take long for me to decide that this was the right place to buy. If anyone from the Bay Area asks me where a good place to a find a used car is I will definitely tell them to go to Diablo Motors. Thank you very much for everything. This letter is to express how easy and trouble-free I have found doing business has been with Diablo Motors. I recently purchased a 2003 BMW M3 convertible from your firm. This is the second vehicle I have purchased from your firm in the past two years. The first vehicle my wife and I purchased from you was a 2000 Mercedes CLK320. Each time the entire process was fast and accurate and trouble-free. Whether I used my own financing or your in-house vendors, I have experienced first class service. Please feel free to use this testimonial as you see fit. I would definitely recommend your firm without any hesitancy to any of my friends or associates. Historically, I have never purchased pre-owned cars and have always worked with larger dealerships when buying cars for my family. After years of absolutely hating the car buying experience, and desperately looking for a car dealer I could work with and trust, I was pleased to find Diablo Motors. What a remarkable difference! The purchasing experience was easy and there was no buying pressure. All I can say is that the initial buying experience, service, and support that I received from Diablo Motors has opened my eyes, and I can also say with certainty that you have a customer for life. I will enthusiastically recommend your dealership to all of my friends. Greg – your business is really a top notch organization and I appreciate everything you’ve done for me. Thank you. It has been a pleasant experience working with your company. This is such a fun car to drive. I have had many compliments on how new it looks and how clean it is. I had been casually searching the internet…for a Jeep Cherokee, when I came across your website. It was great to be able to read a detailed description along with good photos of the autos you have. It makes it so much easier to decide if this is a vehicle worth spending time to look at. What a great convenience! When the people from my Jeep club see it, I am sure they will want to know where I got it and I will send them your way. I appreciated the casual but professional way of your business. Who needs the over-scented, high pressure approach of the typical dealership. Not me. Once again, thank you. I’d like to take this opportunity to thank you for handling the purchase of my Jeep recently. Your professionalism, knowledge, and very pleasant demeanor have made this the most comfortable and easiest car purchase ever. Please feel free to share this feedback with anyone interested, do not hesitate to utilize me as a reference. I hope to see you again soon! This letter is to thank you for making our experience of buying a vehicle a very pleasant one. The GMC truck that we bought from you is exactly as represented. There were no high-pressure tactics or any of the stereotype problems associated with buying from a used car dealer. You were helpful and informative and made it easy to make our choice of the 2000 GMC pickup. In the future, if we or any of our family and friends need to replace a vehicle, we will not hesitate to recommend your business. - James and Jean M.
Three months ago we purchased a 1997 Grand Cherokee from you. We were very favorably impressed with your professionalism and your knowledge of the vehicles you were selling. In addition, your helpfulness in acquiring the best financing was very much appreciated. Your spontaneous nature and courtesy were certainly welcomed and duly noted as well. I would not hesitate in the least to recommend your services to anyone looking for a used vehicle. I wanted to take this opportunity to thank you for your excellent service which you have provided our family when purchasing a car. The Jetta is our fourth car we have purchased from your company. You have always been extremely fair and trustworthy. You also stand behind every car purchased. If anything went wrong we brought the car in and you quickly repaired any problems. At one time, you even came out to our home to take care of needed repairs. Our family members will continue to call you when we’re in the market for a new car. I have also referred other people to your company. Thank you again for your continued service. Thank you so much for getting the DMV registration handled on the Jeep my daughter bought from you. We got the stickers in the mail today. I want you to know that we had such a good experience throughout the whole purchasing process, that now my son wants to buy a Jeep from you too. The fact that you have a daughter yourself gave me such confidence in you as you took the time to explain to my daughter how to maintain her Jeep and keep it in safe running condition. Parent to parent, I felt you understood how important my daughter’s safety is to me. You even gave her driving tips. And she paid attention! (Unlike when she hears these things from Mom and Dad!) I also want to thank you for “going the extra mile” when Valery had her first car repair need. You took care of it so quickly and explained to her how to avoid the problem in the future. I have already told friends and family about Diablo Motors and your excellent service. I would recommend you to anyone who asked. Thank you again. I am enjoying my “new” Mercedes Benz CLK320, and it was a real pleasure doing business with you. Your prices were more than fair, and the car was everything your description said it would be. I have already recommended Diablo Motors to others and will continue to do so. I’m a big believer in letting someone else take the major depreciation hit on a new car, and you have a fine selection of late-model, high-end cars that have low mileage and are in excellent condition. As an alternative to buying from a private owner, your integrity and guaranty take the worry out of the deal, and your dealership services eliminated my having to handle the DMV work myself, as I have in private transactions. Compared with big dealerships, your efficiency and high level of service make the process much faster and more convenient (not to say a lot less expensive). Thanks again for a great car at a great price! We want to thank you for making the purchase of our BMW X5 so easy and stress free. We appreciate your honest and dependable service. This is the second vehicle we have purchased from you, and like always, the vehicle is detailed to look new, and reliable in every day use. We believe your business is successful because of the respect and care you show your customers. You take such pride in the vehicles you sell, which is showcased by the selection of cars in your showroom. We always feel confident when we purchase a vehicle from you because it has been given your stamp of approval. We will continue to purchase cars from you in the future and recommend you to our family and friends. Thank you for everything you do! - Paula P. and Nicole E.
I bought my first car with Greg and it was such a great experience. I didn't have to worry about haggling and he was extremely patient with me. I love my new car and would definitely buy from him again! Greg and his team were the best! Very professional, knowledgeable, courteous and most importantly, fair. I would highly recommend working with Diablo Motors. An overall great experience. Just purchased a 328i from Diablo Motors and we are so happy with the purchase! Unbeatable price and the process was smooth and easy. Greg (the dealership owner) is definitely one of the best car salesman out there. He really knows all there is to BMWs and everything else about cars! A really nice guy who tells you all the details about the vehicle you're looking at. No tricks or deception or gray lines at all. If there is a slight modification to the listing, you're gonna know it. The car we bought has some issues with the tires but we left the door with 4 brand new tires without any additional cost thanks to Greg and his team. You will get a good deal and a good car from this dealership! Diablo Motors: Auto Sales, Service and Detail has been visited 14,726,368 total times.